I absolutely love these lush smooth deep red beads. I acquired these on my recent trip to Hong Kong. Lighting in the shop wasn't optimum and I didn't appreciate the colour shading nor the swirls. After wiping them down - I do that with all my beads, I was very, very happy that we made the trip back to that shop to buy these. My friend Debbie who makes beautiful jewellery too, and lives in HK, patiently took me back to the shop after we had gone way past it. 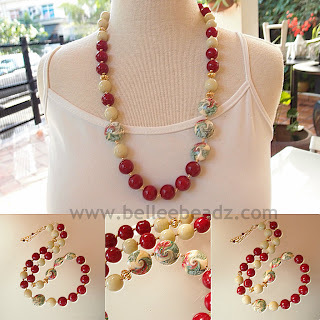 Deep red, vanilla, vermeil and polymer clay beads. 26" from end to end.